Turmeric: Tumeric contains the phytonutrient, curcumin which has been found out to be anti-inflammatory and cancer inhibiting. Garlic: Garlic contains about 200 biologically active compounds that contain amino-acids, cysteine and glutathione. These compounds have protective functions against cancer formation and growth. For garlic to be effective, it should be eaten raw, lightly fried with vegetables or boiled in soups. Spinach: Spinach is a green leafy vegetable reputed for increasing body energy and power. It is rich in chlorophyll and carotene which makes it an anti-cancer food. It is also rich in vitamins, iron, folic acids and minerals as well as the antioxidant coenzyme which has anti-aging properties. 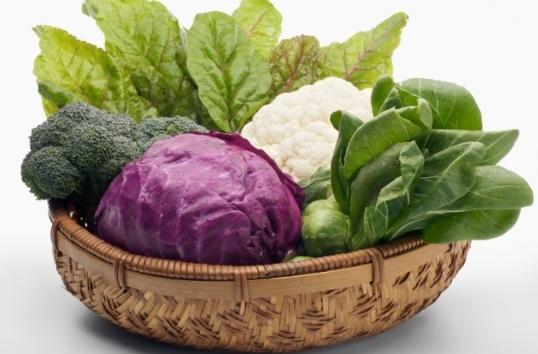 Cruciferous vegetables: These vegetables include kale, cabbage, broccoli, cress, mustard, cauliflower, Brussels and radish. They are beneficial because they contain glucosinolates and phytonutrients which detoxify certain carcinogens and lower the risk of colon cancer. Mushrooms: Mushrooms such as reishi, shiitake and maitake are used to boost immunity, protect and treat cancer. Bee Propolis: Propolis is a substance produced by bees to protect themselves and their hives against fungal, viral and bacterial infections. Propolis is rich in bioflavonoids, amino acids and vitamins which enhances immunity and prevents cancer. Yogurt: Yogurt contains probiotics which improve immunity and detoxify meat carcinogensand environmental toxins. Flavonoid-rich berries: These berries include blueberries, strawberries, cranberries, currants, cherries, raspberries and hawthorn berries. They contain powerful antioxidants, flavonoids, beta-carotene, zinc and selenium. They are crucial for prevention of cancer and can be taken as a snack daily. Fiber-rich foods: Foods rich in fiber are important for healthy bowel movement and prevention of colorectal cancer. Fiber facilitates the movement of food through the digestive tract reducing carcinogens by rotting food in the gut as it passes through. Foods rich in fiber include whole grains, lentils, vegetables, beans and seeds.